I haven’t done a truly role-play inspired or historical type entry for as long as I can remember. So I knew it was about time when a lot of the pieces all tied together from current events such as We Love RP and Square1. For the longest time I’ve been a fan of all things Scottish due to my love for the Highlander films and television series. You may recall in very early entries that I paid homage to them as well. So when I saw the Noble Creations “The Outlander Kilt” I couldn’t pass up the opportunity. It comes with a HUD that gives you three different cloth color choices. Yellow, Red, and Black. There is also a bag accessory (which I did not use for this photo session) that comes in Brown, Green, and Black. Sizes included in the box are for Aesthetic, [SIGNATURE] Gianni, Standard S-L, and TMP. Also from the We Love RP event there are one of three new sets of eyes from MESANGE. This time I am wearing the “Thetis Eyes”. With 15 different color options you are bound to find a tone you like. I found #15 to be a very stunning green which I knew would fit perfectly with my Highland theme. I’d like to take a moment to recommend the beard that I am wearing in this look. It’s made by Yuth and is called the Cyrus. I knew that I was going to like this item based on the ad for it that I originally saw on the marketplace. I did however go to their in-world location to make my purchase and went with the whole set. While it might be a little pricey at $1500L the amount of colors per HUD that you get can’t be beat; it is still a value nonetheless. I was able to size it just right and the included omega appliers made it seamless on my hardened warrior’s face. At one of the previous rounds of We Love RP, I featured a hair from a brand named VoluptasVituralis. There were two hairs that I purchased and this is the second of those two. I bought the full pack for “Aranai” as well because I knew that I could potentially use it for several projects in the future. I really like the vivid textures on this hair, especially on the ginger tone I used. How could I also forget that there is a new round of The Men’s Department going on? That’s right they are back with all new clothing, skins, furniture, pose props and more for you to get your hands on. Speaking of skins, I am wearing the “SHAWN” skin from Stray Dog in the Peach tone. It comes with an two different HUDS to use if you want to go with the eyebrows that were created with the skin and one for you to use your own. What also made this a great choice to use for this photo set is that there is a version that is a bit roughed up. What celtic warrior comes out of battle unscathed? Yeah, I thought so myself. Just in case you were wondering the package does include a brow shaper and body shape as well unless you have one of your own that suits you better. Last but certainly not least is one of the reasons this visual concept came about. 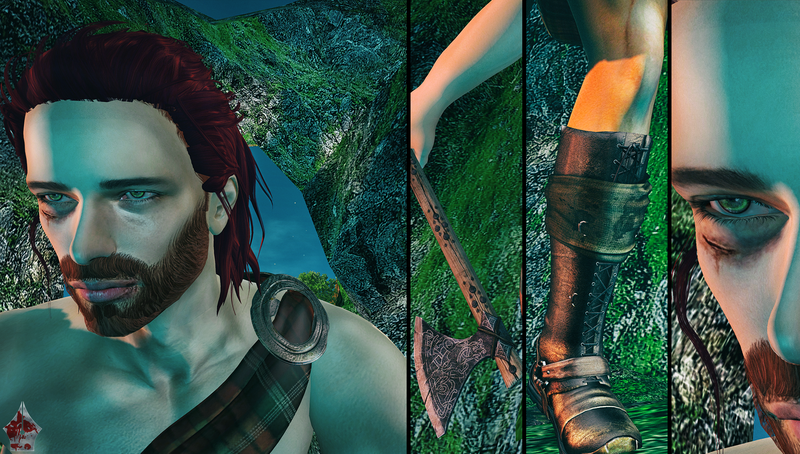 Image Essentials released the “RAGNAR” Bento pose set at the Square1 event. This event seems to be a newer one because I don’t recall seeing it before but this item certainly is worth going to check out if you are into fantasy themed photography. It comes with 5 different poses along with mirror poses as well as two different battle axes. Makes the warrior look come full circle I think and was a huge inspiration when I put this together. A big shout to Kay Weston for bringing this item to us all. I think I have covered just about everything that I can think of so it is that time to wrap up this entry. I enjoyed working on this project and I hope you’ve enjoyed viewing it just the same. Until the next time, stay stylish fellas! Onto the credits!! !